Cannabis is taken in different forms all over the world, while being primarily smoked, it is also eaten raw and has been proven to provide incredible health benefits - whilst also being non-psychoactive, therefore more appealing to a wider of range of people. Marijuana can be described as one of the new range of superfoods, it contains over 400 chemical compounds containing beneficial vitamins, essential oils, and acids. Experts such as Dr. William Courtney have come to call weed a 'dietary essential' Marijuana contains extremely high concentrations of cannabinoid acids which it has been discovered are essential for cell function. The two main cannabinoid acids that have been studies so far are THCa and CBDa. If these acids are heated, through smoking, vaping, or cooking cannabis then they begin to break down into different chemicals, they become degraded into psychoactive THC and cannabinoid CBD. This process is called decarboxylation, or “decarbing.” and it describes breaking down the acids into the form in which they become active. 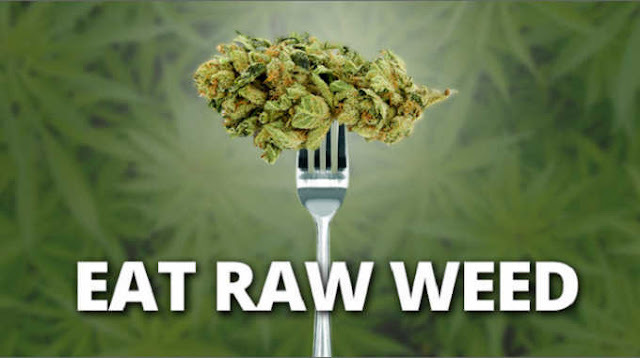 When eaten raw, the body is able to process much larger amounts of THCa and CBDa, and it can then convert these acids into essential nutrients through its metabolism. Cannabis contains a large amount of essential amino acids, like other essential fatty acids our bodies don't produce essential amino acids of their own accord, so we need to introduce them through our diet. Amino acids are essential in that they help cells to function properly, to repair damaged tissue, to maintain structure and to transport nutrients around the body.